It took no time at all for the police to catch him. BBC correspondent John Sudworth was in Guiyang, the capital city of the Guizhou province in southwest China. The city extends 3,100 square miles and is home to around 4.7 million people. Sudworth was on a special assignment to find out whether Chinese law enforcement really could find anyone, anytime. The local police have a digital photo archive of every citizen in the city. And police have access to CCTV cameras everywhere. Many of the systems supporting these cameras use artificial intelligence ("AI") for facial recognition. If you're like us, this sounds like an invasion of privacy. But the city's police claim they want to keep their citizens safe by preventing criminal behavior. For ordinary citizens, police say their cameras will slide right by. But if your face pops up on a camera and you're registered as a person of interest – look out. When the system recognizes a face, it alerts the nearest authorities. After adding his photo and name as a suspect to the database, Sudworth hit the streets to see how long it would take law enforcement to find him. Starting near the city center, he began walking toward the local bus station. After getting out of the car, he counted three CCTV cameras on the first bridge he encountered. There was no point in trying to hide. Cameras identified his face while he entered the bus station and sent an alert to nearby police. As he strolled through the building, chatting with his camera, he noticed the authorities circling around him. Uncertain if they were in on the joke, he decided to surrender and walk off quietly with the police. The whole exercise took just seven minutes. I know this sounds like something out of science fiction. But Sudworth did his experiment a little more than a year ago. Many of you may already use facial recognition on your smartphones. The latest iPhone XR from Apple and Galaxy A8s from Samsung both carry this feature. You can use it to unlock your phone or to confirm your identity to make financial transactions more secure. Think about all the AI systems just in your phone... They're what help music apps like Apple Music, Pandora, or Spotify know what songs you like. The technology embedded in the app keeps track of what you listen to and analyzes the characteristics of other songs to create a similar list. Netflix does the same with your movies. Amazon does it with books and other products you buy. Google shows you ads for products that may interest you based on your past searches. AI makes machines smarter. And it is becoming big business. This year, the AI market could be worth $11.3 billion, according to market intelligence firm Tractica. By 2025, estimates put that number at almost $90 billion, nearly eight times higher. With AI touching myriad sectors – including driverless cars, music, movies, health care, security, and the "Internet of Things" – this shift will give rise to some of the world's most important and lucrative investment stories over the coming months and years. For example, AI and machine learning are already playing critical roles in medicine... particularly in imaging. More than 268,000 women will be diagnosed with breast cancer in the U.S. this year. Pathologists have to analyze thousands of X-ray and MRI images looking for tiny, subtle details on each photo. It's an almost impossible task. And missing an important detail could mean the difference between life and death. Statistics show that they only get it right about 70% of the time. In 2011, engineer Krista Jones found a lump in her breast. She had to rely on human analysis to treat her rare kind of cancer. She went through four years of scans, ultrasounds, biopsies, and surgeries. It seemed that a double mastectomy was the only answer for her. That is, until 2015, when she found a doctor who took a different approach. He used big data and machine learning to spot her tumors and treat them directly with radiation therapy. This plan of attack not only stopped her tumor growth, but has kept her cancer-free for more than two years. We love stories about people beating this awful and deadly disease. It proves that technology is literally saving lives. I was thankful for the AI that saved my life. When it comes to diagnosis and treatment, AI will radically improve the quality of treatment for patients... and the productivity of doctors. In other words, it will make doctors better at saving lives. 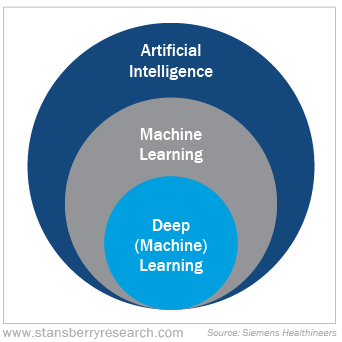 Machine learning, deep learning, and artificial intelligence are intertwined fields of computer science. Both machine learning and deep learning teach computers to think like humans. They allow software to adjust and improve over time by using large training datasets. The training data allow the software to learn context, so that it has a basis to learn. It's the same learning process a person goes through when he learns something new. And for radiologists, this is great news. AI will allow their software to identify abnormalities in CT and MRI scans that are too small to spot with the human eye. It's all part of Big Data. Research firm McKinsey estimates that Big Data, which includes machine learning, and analytics will become a roughly $100-billion-a-year business in earnings before interest, taxes, depreciation, and amortization (EBITDA), going by the median forecast. Everyone is talking about AI. As I've shown you today, the applications are manifold... and hundreds – if not thousands – of companies are using AI to develop their products and services. We're seeing it in facial recognition, like the Chinese are using for safer streets. Smartphones use it for secure access. Manufacturers are using similar technology in cars and trucks to keep drivers on the road. And AI will play a huge role in the future of medical innovation. This revolutionary technology is taking a leading role in our daily lives. It's already started... And it will see explosive growth from here. So get ready. I expect the companies riding this big trend will be some of the stock market's biggest winners in the next several years. Editor's note: Christian and the Stansberry Research team just got a look at today's biggest tech trends at the Consumer Electronics Show. They saw everything from driverless cars to robots playing ping-pong... And now, they want to share their findings with you. This special offer is the only way to access their brand-new portfolio of stocks, each of which could turn every $1,000 invested into $10,000 or more over the long haul... Learn more here. "Cybercrime is the world's fastest-growing criminal business," Christian says. "That offers huge potential for companies with the right products and the right people to maximize the opportunity." Get the details on how you can invest easily right here. "Machines are learning to think for themselves," Dave Lashmet writes. This breakthrough technology is on the horizon... And one company is poised to profit. Learn more here: The One Company Set to Power the Driverless Car and Truck Revolution. Denny’s (DENN) is one of the largest full-service restaurant chains in the United States… And it has more than 1,700 restaurants across the world. Recently, the company was about 90% franchised. And in October, it announced plans to sell more of its company-owned stores. Denny’s will be almost entirely franchisee-owned – think 95%-97% – which will save the company money on upkeep and management. Meanwhile, it gets to focus on licensing its restaurants to franchisees… and collecting revenues.